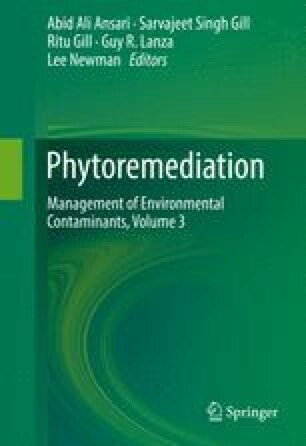 Phytoextraction, as the most commonly used technique in phytoremediation, involves the utilization of plant-hyperaccumulators for the absorption pollutants (primarily heavy metals) from the environment, their transport, and concentration in the biomass of harvestable organs. This in situ, cost-effective technology could improve the quality of moderately contaminated lands and waters within realistic time scales. For a successful implementation of phytoextraction, the main prerequisite is to identify native plants which are able to extract (absorb), degrade, or sequester hazardous contaminants from growing media and develop strategies for making hybrids and genetically modified plants which are good candidates for phytoextraction. Because of their rapid growth rate and high biomass yield, their adaptability to different ecological conditions and genetic variability is outstanding. Willows and poplars from the Salicaceae family are valuable resources for the use of phytoremediation. Also, species like the eucalypt, black locust, birch, and paulownia are defined by numerous researchers as good candidates for phytoextraction due to their high metal bioconcentration ability and high yield. There have been numerous studies confirming that species with a role in phytoextraction developed a complex network of homeostatic metabolic mechanisms in order to control metal uptake, accumulation, (re)distribution, and detoxification. Landberg T, Greger M (1996) Differences in uptake and tolerance to heavy metals in Salix from unpolluted and polluted areas. Appl Geochem [Internet] 11(1–2):175–180. http://www.sciencedirect.com/science/article/pii/0883292795000828.